Today I'm featuring another 'Name to know' as part of an occasional series introducing independent shops and designers I hope you will enjoy discovering. Founded by former fashion buyer Nuala Sharkey and based in East London, LO+BEHOLD is a new online destination which brings together a collection of colourful and creative homeware and gifts for the modern home. "As a mum of 2 young boys, I was looking to create more work-life balance than my previous career could offer" said Nuala. "I've always had a desire to create my own business and so this felt like a way to follow my passion and be able to see the kids a bit more. So the website was born from a passion for interiors and homeware, especially Scandinavian, but in our own home we love to mix vintage pieces with modern to create an eclectic look. We may add some vintage to the range further along... so watch this space." "The vision for the store was to create a destination offering the quirkier side of Scandinavian homeware. The pieces are carefully selected for their colour, pattern or their ability to work as a statement piece. Our own style is fairly minimal and we prefer a neutral palette with white and greys, so these pieces add the vital colour and personality. My own background training was in textile design so I'm especially drawn to fabric and pattern, which has influenced the product selection." "We wanted the website to reflect the modern but minimal selection so the branding and design was worked on with that in mind. We also wanted the website to be as beautiful as its contents and hope we've achieved that. We've tried to follow this ethos from the website through to the packaging so that the whole customer experience should reflect the lovely nature of our product." "We've got a Scandi slant, but not exclusively so," says Nuala. "We choose each product for its ability to transform your home into a cool, vibrant and happy place." Playful graphic cushions, stylish shelving, brass vases, marble kitchen accessories, minimal lighting and other stylish, affordable updates designed to add personality and a relaxed vibe to your home. Brands like Ferm Living and Broste Copenhagen feature alongside pieces by Hackney based designer Eleanor Bolton. ...this geometric mohair blanket by Dutch designer Lile Sadi (above). A stand out piece that would liven up any room, the colour palette includes pretty much all of the shades I'm in love with right now - indigo, blush, soft grey and white. I love Broste Copenhagen. Every season they consistently offer up the kind of affordable easy updates I want to buy when a particular area of my home is in need of a refresh. This tall brass vase being a case in point. Also by Broste Copenhagen, these cool paper lamp shades would be a great option for the bedroom, the living room or even your home office. Available in black or white they come in a range of shapes and sizes - and at under £50 they won't break the bank either. These wooden wall storage boxes by Danish brand Hubsch are perfect for keeping magazines and stationery neat and organised. They'd also make a handy reading shelf next to the bed. This print and patchwork cushion designed Lotte Fynboe of Oyoy features a playful pattern and a different colour combination on each side. I've admired leather shelving brackets in numerous Pinterest shots - and featured a couple of examples in this post a while back - but hadn't come across anything similar being stocked in the UK until I spotted these. Mixing up different textures and materials is often my favourite approach when I'm tackling a room makeover project and this contrast beween the leather and the wood, along with the seagrass baskets and the pretty blue and white ceramics, is particularly pleasing. Nuala also picks these out as among her favourite pieces in the shop. "I love how this small leather detail can transform a simple shelf into something more interesting and unique" she says. My collection of house plants continues to grow. I am forever moving them around and grouping them together in different displays, but I like the idea of suspending plants from the ceiling as a way of drawing the eye down and adding unexpected focal points at different eye levels. 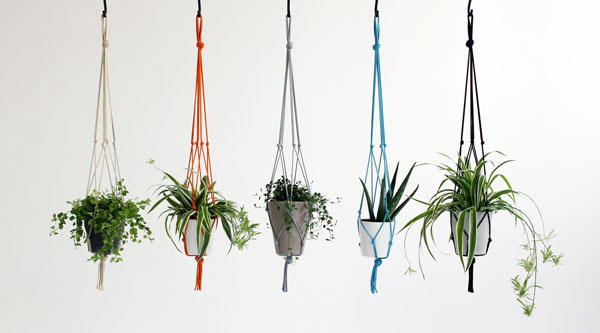 I grew up in a house full of spider plants and macrame plant holders, and it was surely only a matter of time before these made a comeback, so for me there is something appealingly nostalgic about Eleanor Bolton's colourful knotted plant hangers. The Hackney based designer has added a modern colour palette to this retro design and each one comes in its own stylish tube packaging - making them the perfect item to give as a gift to any plant loving friends. I for one absolutely love them. Who knows, I could even be persuaded to get a Spider plant. The LO+BEHOLD summer sale starts tomorrow with up to 25% off selected items. They are also currently running a competition in which they'll be giving away a £100 gift voucher. All the details are over on the LO+BEHOLD blog. Follow LO+BEHOLD on instagram for more lovely Scandi inspired home accessories and inspiration. Posted in collaboration with Lo + Behold.